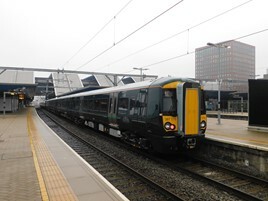 Forty-one Class 387/1 Electrostars are now in daily use with Great Western Railway, after electric services were extended to Didcot Parkway. The official timetable change was January 2, although trains formed of ‘387s’ started running from Reading from December 28. The first train was the 0354 Reading-London Paddington, but this was eventually cancelled at Slough, with RAIL sources suggesting there was “a block to electric traction after Twyford and overrunning engineering”. Maintenance of the Class 387/1s is now being carried out at Reading depot, with the mileage exams starting to increase. So far, the four-car trains have largely been limited to visual exams and off-plan maintenance, due to their relative low mileage. However, extension of the electric services to Didcot Parkway means that the ‘387s’ are now covering more miles, and so the first sets (387130-387137) are visiting Reading depot for bigger exams. The first T504 exams have been carried out. These are done after 504 days in traffic, with 387136 the first to be treated, followed by 387131. This involves a more intrusive exam compared with the lighter T45 exam (carried out after 45 days), and involves work on electrical equipment as well as visual checks. For the full story, read RAIL 844, out now on Android/iPad, and on the shelves January 17. The GWR Class 387’s are very good trains and have replaced the DMU Class 166’s Networkers that are operating on local branch lines in the Bristol area, North Devon and Westcountry. Whilst Class 165’s will remain on the Thames Valley branch lines services (Maidenhead-Marlow, Twyford-Henley-on-Thames and Slough-Windsor & Eton Central), Reading-Basingstoke and Reading-Redhill/Gatwick Airport services. Also GWR could receive the 6 Class 387's that c2c are hiring those till new trains comes in from 2021 and the 6 Class 387/3 (387301-387306) could be transferred to GWR and the entire 45 Class 387/1's (387130-387174) could be reclassified as Class 387/3's making a total of 51 Class 387's (387301-387351) on the GWR network.